Originally designed and internationally patented as a beam clamp, SuperClamp™ products may be used for both hoisting and lifting applications. The line has been expanded to include Runway Beam Trolleys designed like the original SuperClamp™ to be a one piece fully adjustable trolley. Recently a new design, the Universal Superclamp was added to the line. This model is designed to be used at full rated capacity at angles up to 90° in a 360° radius. Design exceeds 5:1 factor of safety. Periodic tests to destruction are performed to ensure this. Each unit is Proof Load Tested at 2:1, and comes with a Certificate of Test and Evaluation. Units are individually serial numbered to assist with traceability. Side Plates and Jaws are ASTM A588 steel. Lifting Shackle is fully heat treated and normalized. All welding procedures are AWD D1.1 certified. Each unit is one piece, fully adjustable and includes attached lifting shackle. All trolleys include Anti-Drop plates as an integral part of the structure. Design is covered by U.S. and foreign patents. Clamp adjustability range and jaw size are designed to ensure optimum contact with the beam flange to ensure personnel and equipment safety. All designs meet or exceed existing codes and regulations, including ANSI/ASME B30.20 "Below-the-Hook Lifting Devices." Full Product Liability Insurance coverage is maintained. In use in the Mining; On and Off Shore Mineral Exploration; General Maintenance and Construction industries; SuperClamp™ continues to lead the way in safe lifting applications. A. There is no doubt that SuperClamp™ as an anchor point offers probably the safest method of attaching and securing to an overhead girder or arch beam section. B. Due to the design and engineering features of SuperClamp™, it will not slide, slip, or shudder during the lifting operation. C. SuperClamp™ products are designed with a 5:1 Factor of Safety. D. Each clamp is issued with a Certificate of Test and Examination. 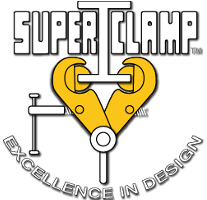 E. SuperClamp™ as a lifting tool either singularly or in pairs (i.e., in the lifting of spreader beams) is undoubtedly the safest means available. A. The left and right hand threaded bar means the SuperClamp™ can easily be adjusted to facilitate application and can be hand-tightened in a matter of seconds to give maximum positive hold. B. Similarly, the SuperClamp™ can be disengaged "in seconds" without involving the user in any untidy and dangerous operation. A. The tremendous adjustability of SuperClamp™ means that very often one unit can be employed in various applications and situations where alternative methods involve up to three or more individual units. In short, one SuperClamp™ replaces three of anyone else's. B. SuperClamp™ is sold into a worldwide range of industries with many varied applications: Wherever there is a lifting situation! Because of SuperClamp™'s built-in safety features, speed of application and versatility, great cost savings are made against damaged materials, injury to personnel, application time, loss or damage to component parts, lower inventory and extended product life. We have a recertification program where the clamp can be returned to us to be repaired, load tested, and recertified. This is more cost effective and time efficient then replacing the clamp. SuperClamp™ products are easily stored in one piece and are readily available for maintenance and inspection.